Welcome to 1st Choice Plumbing, LLC! Call us first for all of your plumbing repairs in Rock Hill, SC. At 1st Choice Plumbing, our obligation is to you, the customer. We will strive to make each and every customer 100% satisfied. When you need a plumber in Rock Hill, SC, make us your 1st Choice for plumbing! 1st Choice Plumbing, LLC is a full service plumbing company located in Rock Hill, SC. We are fully licensed and insured. We service the following areas: Rock Hill, Tega Cay, Fort Mill, York, Clover, Lancaster, Fort Lawn, Indian Land, Chester, Heath Springs, Kershaw, and surrounding areas in South Carolina. We are able to handle any and all well pump issues quickly and efficiently. Need a bathroom remodeled? No problem. 1st Choice Plumbing does that as well. Our team will strip and tear out your old bathroom, rebuilding it using new cabinets, countertops, sinks, fixtures, hardware, tubs, and showers. Your new bathroom will be beautiful, resilient, and easy to care for. We offer a wide range of cabinet options for any taste or budget. Bathroom remodeling in Rock Hill, SC has never been easier. Give 1st Choice Plumbing a call. A sampling of our repair services is listed below. Please give us a call if you have any questions about our services or our warranties. 1st Choice Plumbing is a family owned and operated business. After many years in the plumbing business, Thomas Carter decided to start his own company in 2008. 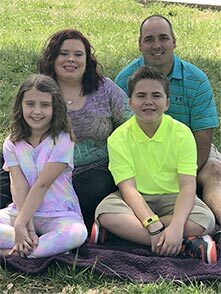 Along with his wife, Jonna, he founded 1st Choice Plumbing to provide quality service at reasonable prices for customers throughout the Lancaster, SC area. Thomas is a Master Plumber in the state of South Carolina and holds many other certifications and specializations. He puts his experience to work every day as he solves all types of plumbing problems. Jonna is our office manager. With over 20 years of work in the customer service industry, she’s dedicated to providing the best possible experience for every person who calls our business. Together, Thomas and Jonna have an amazing son that’s their whole world. As you can see, it’s truly a family affair here at 1st Choice Plumbing! 1st Choice Plumbing serves the Rock Hill and Lancaster areas, including Tega Cay, Fort Mill, Clover, and Indian Land. Call us first for 24 hour plumbing repairs or for a free estimate.